Law school is quite different than undergrad. The assignments can be overwhelming, and you are expected to primarily learn the rules of the law outside of the classroom on your own time. All of this means as a 1L you must quickly adjust to a new learning style and, perhaps most importantly, choose the right tools to help you learn the rules of the law in the most effective and efficient manner. The BARBRI 1L Mastery Package gives currently enrolled 1L’s access to highly effective study aids and final exam review tools, covering all required 1L subjects. 1L Mastery is intended for current 1Ls seeking clarity and practice during the academic year. Those students who have not yet begun their law study, should enroll in BARBRI Law Preview, a proven, 6-day program taken before law school begins that is specifically designed to provide entering 1Ls a measurable advantage before classes begin. Students who enroll in BARBRI Law Preview receive BARBRI 1L Mastery for free when classes begin in the fall. Our detailed 1L course outlines kickstart the outlining process and reinforce your grasp of the substantive rules (the black letter law) so you can apply the law during class discussions and on final exams. 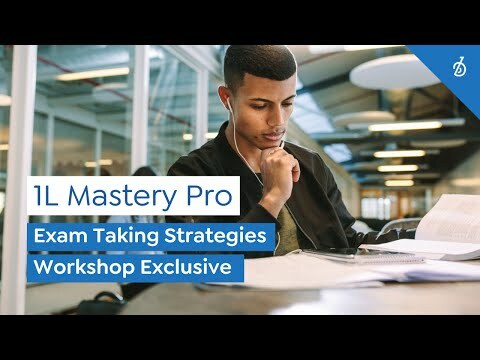 BARBRI 1L Mastery comes with practice essay questions and hundreds of practice multiple-choice questions that relate to specific sections of the video lectures. Watch a lecture, outline your notes, then work practice questions on that subject for the most effective learning and retention. Move beyond rote memorization of rules and elements into fully learning the law. Fill out this form to get a BARBRI 1L Mastery Package video lecture sample presented by renowned Civil Procedure expert and published author, Professor Rich Freer. The BARBRI first year outlines saved me this year! The materials are GOLD!! The BARBRI outlines are very efficient and great at breaking down complicated topics. I also used the practice essays and multiple choice questions when studying for my exams. I finished the year in the top 13% of the class, making dean’s list! I also won an excellence for the future award for getting the highest grade in my property law class! I would highly recommend the BARBRI 1L Student Success Package. UNSURE HOW TO OWN 1L YEAR? START WITH OUR FREE 1L WEBINARS. Know the keys to law school success early on. Attend our exclusive 1L webinar series.